It's comforting to imagine that superstars in their fields were just born better equipped than the rest of us. When a co-worker loses 20 pounds, or a friend runs a marathon while completing a huge project at work, we assume they have more grit, more willpower, more innate talent, and above all, more motivation to see their goals through. But that's not at actually true, as popular Inc.com columnist Jeff Haden proves. 'Motivation' as we know it is a myth. Motivation isn't the special sauce that we require at the beginning of any major change. In fact, motivation is a result of process, not a cause. Understanding this will change the way you approach any obstacle or big goal. 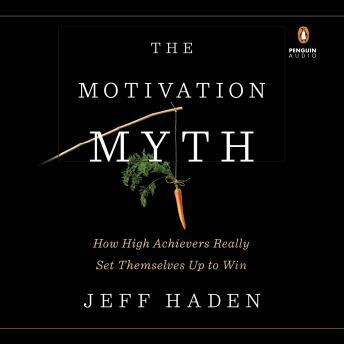 Haden shows us how to reframe our thinking about the relationship of motivation to success. He meets us at our level--at the beginning of any big goal we have for our lives, a little anxious and unsure about our way forward, a little burned by self help books and strategies that have failed us in the past—and offers practical advice that anyone can use to stop stalling and start working on those dreams. Haden takes the mystery out of accomplishment, proving that success isn't about spiritual awakening or a lightning bolt of inspiration --as Tony Robbins and adherents of The Secret believe--but instead, about clear and repeatable processes. Using his own advice, Haden has consistently drawn 2 million readers a month to his posts, completed a 107-mile long mountain bike race, and lost 10 pounds in a month. Success isn't for the uniquely-qualified; it's possible for any person who understands the true nature of motivation. Jeff Haden can help you transcend average and make lasting positive change in your life. Ray Porter brings the book to life. Amazing Book Jeff.